The default view shows a single parcel. There are a number of ways to display the columns if there is more than one parcel. The first way is to select the number of parcels from the drop down. The subject can have up to ten (10) parcels. The columns for the selected number of parcels will be shown. Note that the Totals column appears when there is more than one parcel. Fill in the appropriate data for each parcel. The totals column summarizes the values for all parcels. All the table on this worksheet are automatically updated for the number of parcels selected from the dropdown. Another way to add columns for more than one parcel is to click on the Show Columns button (see above). This will display all 10 columns. At the top of each column there is a drop down box that is set to 'Hide'. For each desired parcel, select 'Show'. The parcel numbers must be consecutive! There is an additional option of selecting 'Auto', which indicates the column is hidden when empty, but will show if certain fields contain a value. When the desired columns have been selected and changed to 'Show' or 'Auto', click on 'Hide Columns' to reformat the table to show only the existing parcels. 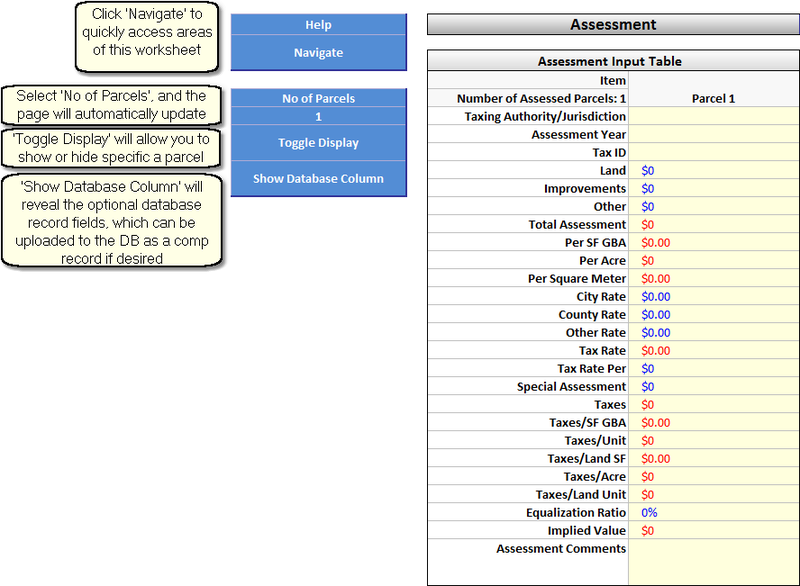 The reformatted Assessment Table for three (3) parcels is shown below. Click the 'Show Database Column' to show the assessment information that will be saved when the subject property is saved as a database record (optional). This can ignored if the subject is not being saved as a database record. Note: The subject can be saved as a Sale, Listing, Contract or Appraisal Record. Because there are potentially several parcels (up to 10) associated with the subject, Narrative1 gives the analyst a choice of how to organize the data as a single database record via the Method selection. Parcel 1. This method utilizes the value for Parcel 1. Concatenate. This method builds a text string comprised of the value entered for each parcel, separated by brackets and a number. For example " Tax ID 1-1  Tax ID 1-2"
Note: If the Database Column and the Method Column are white, this indicates there is no corresponding database field for this information. Not all subject information is necessary to create a database record. 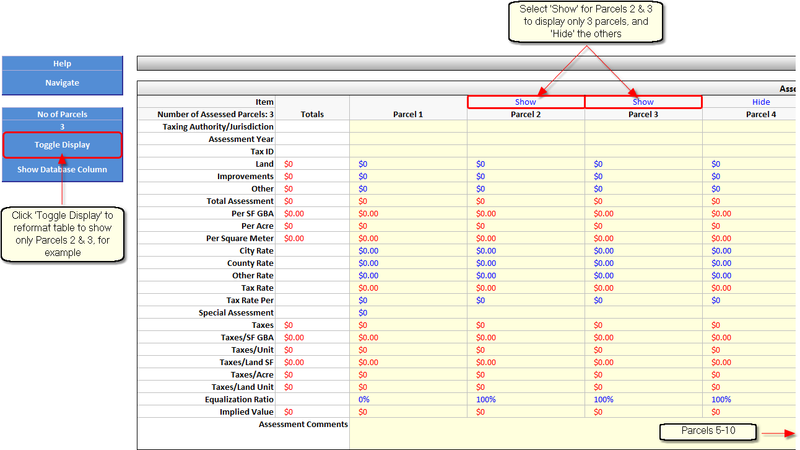 This table can be reached from the dropdown Go to.. button, or by clicking on the arrow key in the upper left corner of the worksheet. The navigation button group consists of two arrows and a dropdown box. The dropdown box lists the other tables on this worksheet for selection. The arrows bring the user to the previous (left arrow) or next (right arrow) table on this worksheet. This table allows columns and rows to be shown and hidden. Hiding rows and columns hides rows and columns that are not used and have been indicated as 'Hide' in the cell to left for rows or in the cell above for columns. 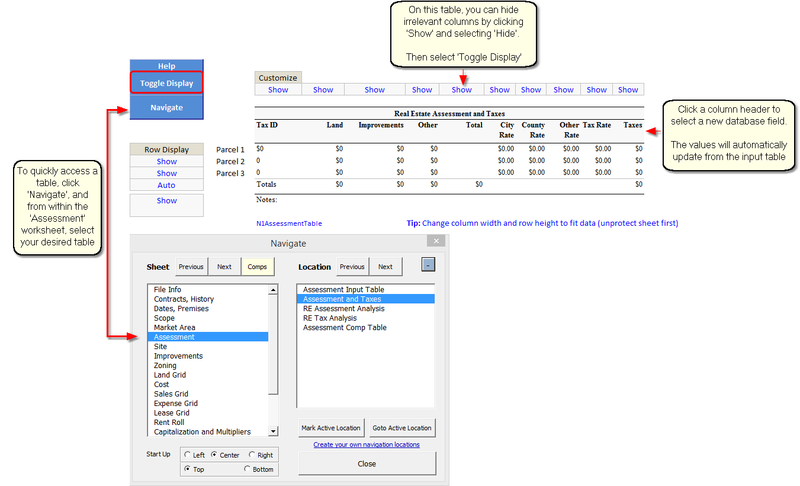 Customizing the table can be done by clicking in the field column header. This shows a dropdown with possible fields to be selected for the column header value. Selecting a new header value will populate the table with appropriate information. 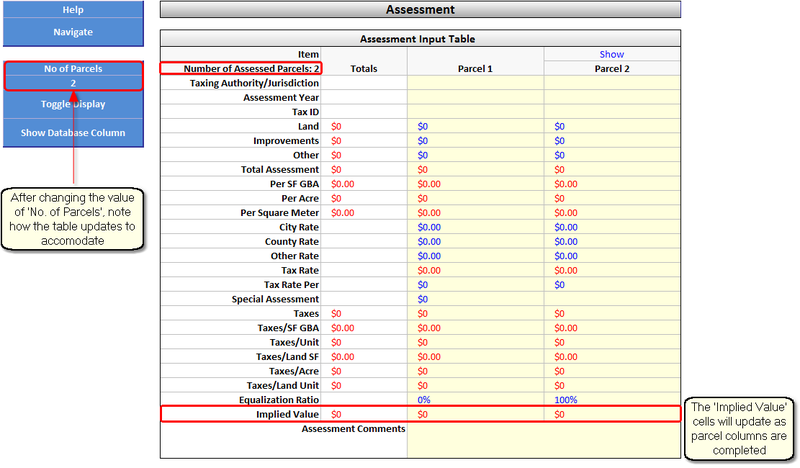 The final table on this worksheet is the Real Estate Assessment Analysis table. 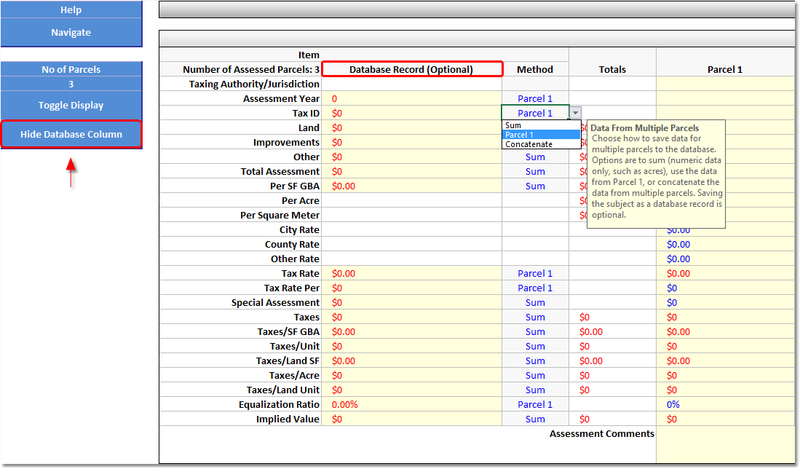 There are navigation buttons, Show/Hide Rows/Columns button, column Show/Hide buttons, and row Show/Hide buttons for this table similar to the buttons for the Assessment and Taxes table (shown above).